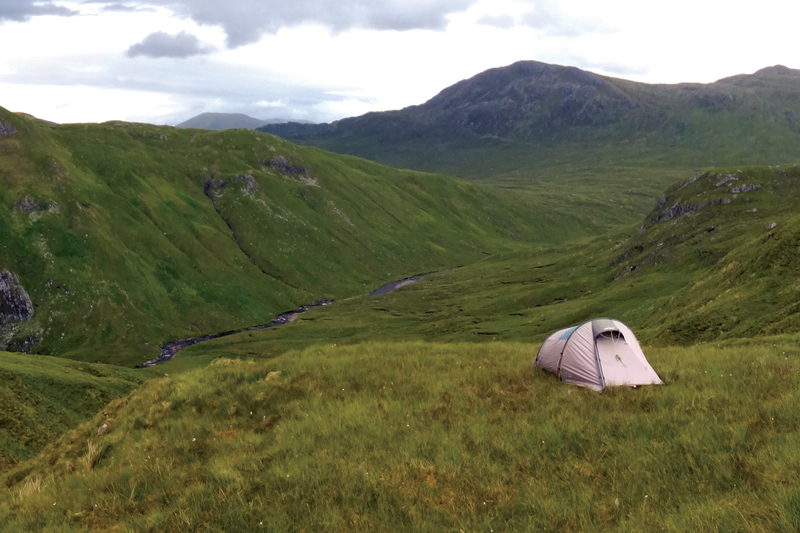 Outdoor steels itself for a nine day wilderness bog-bash along the Cape Wrath Trail to summit one of Scotland's sweetest and most remote peaks. Some things are impossible to prepare for. Take nine days of wet feet, for example. Short of wearing soggy socks and boots for a week and a half, the only training you can do is the walk itself. No matter how much wax I slop on my boots, I’ll soon be embracing prune-dom and pain. My mission has a squelch factor of five, but I know that immersion in the majestic glens, sweeping valleys and mystical bealachs (saddles) of this 330km trail will be worth it. Besides, I have plasters, gel and tight-fitting socks. There are no waymarkers along the trail, and often no paths at all. I’m tackling the southern section (130km), so I won’t reach Cape Wrath, the most north-westerly point of mainland Scotland. ‘Wrath’ is Norse for ‘turning point’. Once the Vikings had veered around this cape, they were able to steer bows homeward. 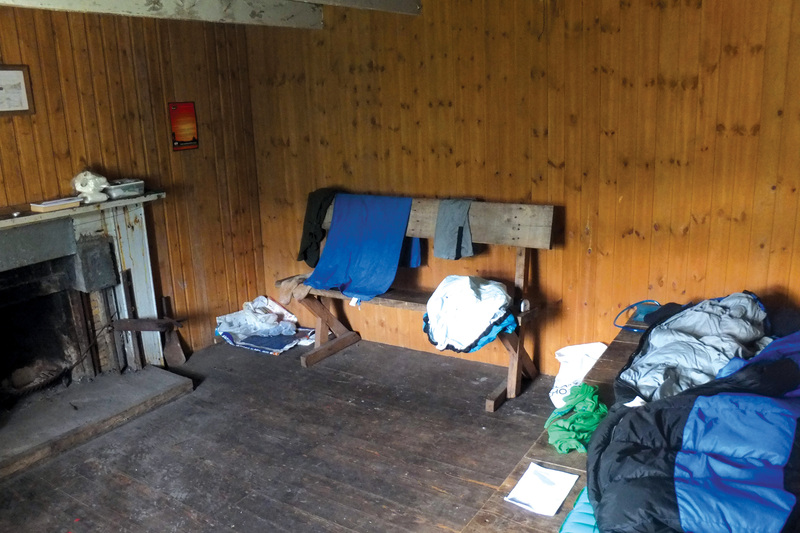 Bothies – basic stone shelters with wooden bunks and a fireplace – dot the trail. Estate owners have built them as refuges for walkers. But space is limited, so I’ve bought my tent to wild camp. Contrary to the norm, I’ll be looking for exposed sites – not too windy, but breezy enough to blow away the midges. 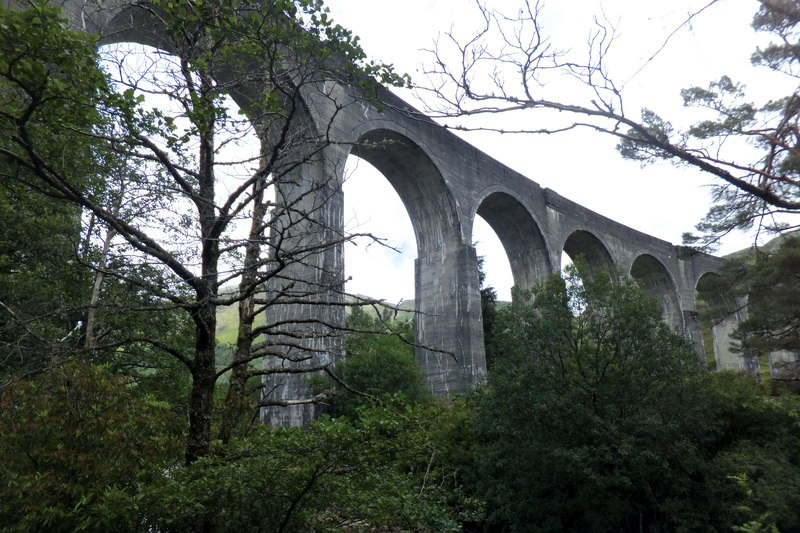 My start point is Glenfinnan, with its viaduct made famous by the Harry Potter movies. Here, I leave my broomstick behind; it’s time to continue on foot. It’s mid-afternoon when I ascend to my first bealach. The bog-fest is on. I slip over twice descending into an enormous valley. A stream snakes away into the distance. The wilderness-feel is immediate. I’m hoping to cover 19km and reach A’chuil bothy. But in my rush to get there before dark, I’ve walked for six hours straight. Having done no on-pack training during the lead-up to this trip (not recommended! ), my IT band is super stressed. If that goes, which feels imminent, I’ll be unable to bend my leg. I cross a river and hobble for 4km along a midge-infested gravel road in a pine forest. Eventually I spy the bothy through the foliage. The chimney is smoking. Inside, five people sit snugly before a fire. I befriend Colin who has come here to escape the craziness of Glasgow. It’s his first hike and he’s a little nervous about navigation. Personally, I’m a little nervous about my knee and how it’s going to perform – or not – tomorrow. Injury is tricky to legislate for. Any regular practice that fosters strong psychology, such as a sweat lodge, is helpful; that’s because how you react to an injury often determines how much it affects your journey (in relation to minor sprains and muscle pulls at least). I also do yoga, which I’ve found lessens the impact of injury. Thanks to it my muscles are used to bending in all directions. I’m trying to walk as though nothing is wrong, but even after 11 hours of rest my IT band is still grumpy. I’m heading into the Rough Bounds of Knoydart, which has undulating terrain with a healthy dollop of splosh. I’m learning how to walk again. This injury has made me realise how much I walk on the outside of my feet, and how much strain that puts on my IT band. I transfer the weight of my footfalls to the instep. I summon patience. I’m as fast as a snail on crutches. My isolation suddenly hits me. A survival gene tingles into life. Somewhere. Up ahead, I watch Colin plodding halfway up a steep hill. He’s heading the wrong way. The bothy at Sourlies, our destination this evening, is west; Colin’s tracking north. I try to get his attention, but he’s in a packhorse trance. He’ll realise soon enough, surely. I snake through a valley beside two lochans glistening in afternoon sunshine. On downhill stretches, I have to waddle like a penguin. I take breaks every hour or two to massage and relax the knee. Afternoon sunshine blazes. Gnats hover in packs. I cross a river and walk beside a deep gorge. The view opens up and I spy 20km long Loch Nevis for the first time, at the head of which lies Sourlies bothy. A steep descent to the bay tests my waddling skills. I arrive at the bothy at 8:30pm. It’s full (six people). Colin is around the side throwing up. He’s only just arrived as well. He ended up traversing sheer cliff edges, jagged dead ends he had to clamber back up to prevent falling off. I spy a big graze on his leg. He tells me he had a panic attack, when he almost down-climbed too far and thought he wouldn’t be able to scramble back up. Eventually he slalomed down grassy corridors to safety. Colin’s too traumatised to eat even though he’s hungry. I sit with him awhile. He’s annoyed because he made a pact with himself to be attentive and consult his map. This walk is reflecting patterns in his daily life where he makes agreements with himself, but never follows up with action. All excuses and distractions fall away out here; the land urges us to take self-responsibility or face the precipice. In the morning, I leave Colin to rest and head across a huge boggy plain underneath a clear red sky, towards the ruins of Carnach. An Austrian man in the bothy told me he got stuck waist deep in this section yesterday. His partner had to yank him out with a walking pole. I tread carefully, tracking around the edge of the plain. I cross the River Carnach and the valley steepens beneath the gaze of mountains. The path continuously tests my knee with slippery rocks and mud. Eventually I come out into a gorgeous valley. I think of Colin here because the way ahead isn’t obvious. He’ll need to consistently consult his map to spot this indistinct turn-off. If he doesn’t, then he’ll be hip deep in boggy desolation, well and truly in the realm of the rescue helicopter. I feel like a pilgrim with an ancient connection to this land. Being here is important somehow, as if the landscape is teaching me a new way of walking through life. For once, I’m conscious of each and every footstep. This pain is a perverse gift. It’s forcing me into conscious walking. 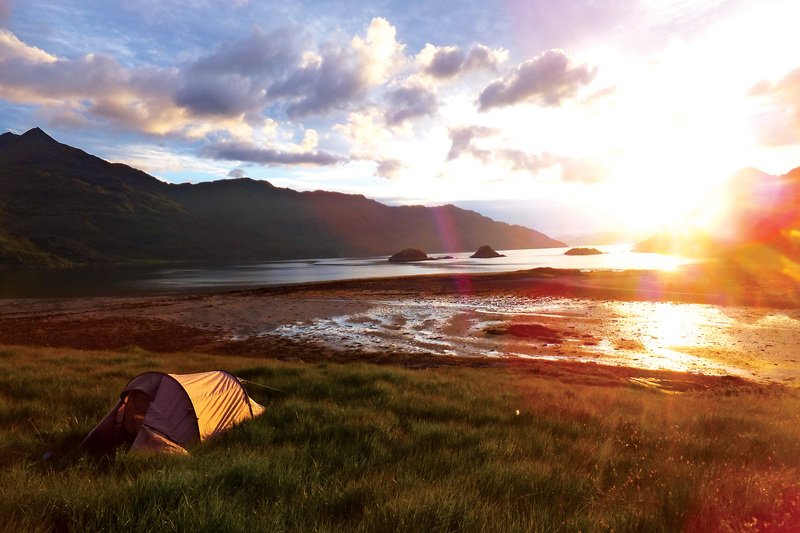 I wild camp on the shores of Loch Hourn, a sea loch stretching 22km. A miraculous sunset unfurls, starting off silvery-grey before waning beams burst through and splash everything a sumptuous gold. Dawn is a different story. Low cloud and drizzle chaperone me around the 8km undulating shoreline of Loch Hourn. Bushes crowd the path, and although it’s not raining hard, rubbing against them saturates me. 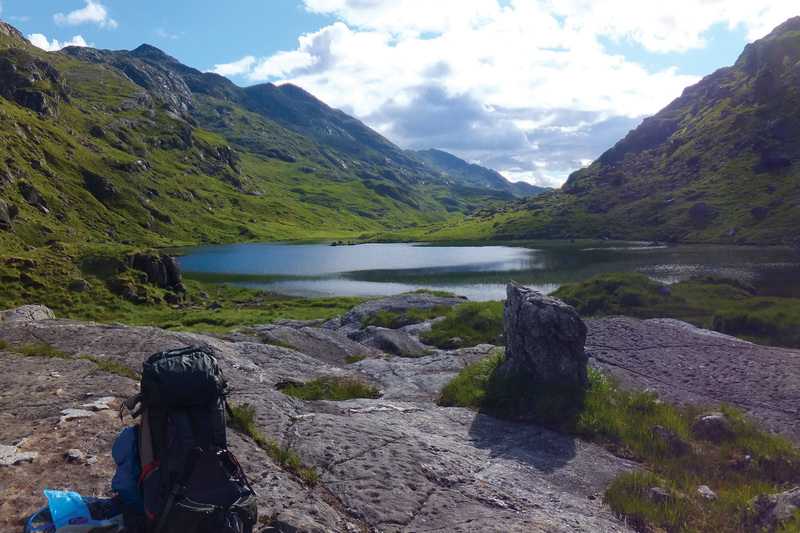 One of the biggest preparatory challenges of this walk was researching flat wild camps that were near water and evenly spaced apart so I didn’t have to walk mammoth distances each day. Later in the day, I head to one of the more dubious sites, eyes peeled in the gathering gloom for anything flat and devoid of swamp. The weather closes in. There’s no path and navigation is cumbersome. Eventually I reach my earmarked spot and find a decent site. I sit outside for as long as possible, watching cloud engulf everything until I’m immersed in a white void. Next morning, the cloud is still lingering, but I’m intent on climbing the serrated Forcan Ridge, and perching atop The Saddle (1010m). 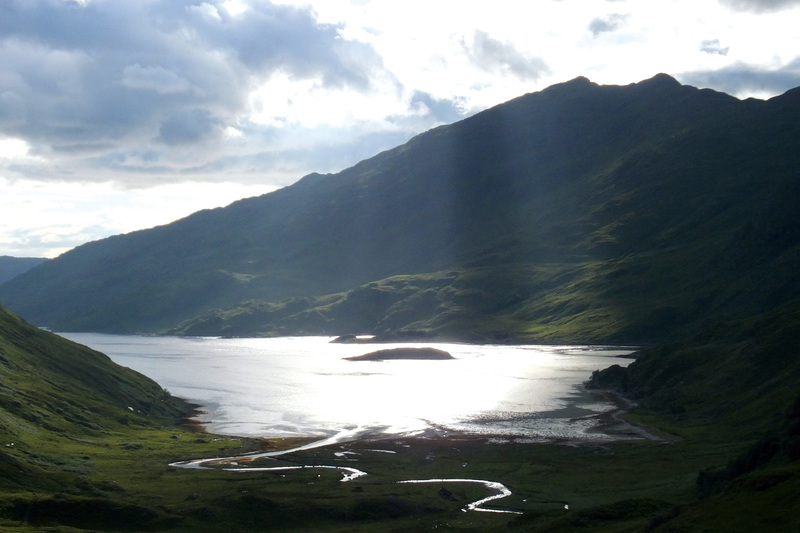 Cloud sporadically lifts to reveal lonely lochans and sweeping views of the valley. After five days immersed in bogs, my feet look like they belong to a centenarian. They’re blistered and my ankles are chaffed and sore from soggy sock rubbing. To boost morale, I treat myself to deep-fried haggis and sticky toffee pudding for breakfast at Shiel Bridge, the only snippet of civilisation along this southern section until I reach Strathcarron, the end point. I leave town and weave through a network of forest tracks before emerging onto a windswept moor. The weather looks unstable, so I set up my tent near the top of Britain’s tallest waterfall, Glomach, which tumbles into a rugged gorge. I can almost taste the sweetness of the mountain, Bidein a’ Choire Sheasgaich (which translates to ‘peak of the corrie of the milkless cattle’). Gaelic confounds most English speakers, and the early hikers that came to this area pronounced Sheasgaich as ‘cheesecake’ (it’s more like ‘hiss-keeg’). I scramble 700m to the summit, disturbing a pack of 40 deer en route. The view from the top is the pinnacle of the many pearling panoramas from this trip. The bog-bash to one of Scotland’s remotest Munro peaks has been worth it. Looking west, towards the Isle of Skye, I see the jagged Black Cuillin, Britain’s most dramatic mountain range. There are peaks everywhere I look, and a band of rain blowing in from the north-east. I descend to the shores of Loch Calavie and plod on to Bendronaig Lodge, a bothy with the luxury of a flushing toilet. It’s my last day and I’m looking down on Strathcarron, onto the railway that will take me back to Inverness and a hot shower. I’ve got 2km before I can rest my weary body, but my IT band has suddenly packed in. I can no longer bend my right leg. I hobble and grimace, not believing this has happened so close to the end. I swear profusely. They can probably hear me in Strathcarron, but I don’t care. I’m angry with my body for not being able to go the distance. After several minutes ranting to nobody about it, I suddenly stop. My body is amazing. It has carried me through Bog-fest Central with an injury. It has performed incredibly under the circumstances. I calm myself down, and focus on an attitude of gratitude. I massage the knee. I thank it for carrying me so far. I’m so lucky it didn’t go earlier than this, when I was totally isolated. And then a strange thing happens: the knee stops hurting. I’ve been limping for a kilometre, but as I enter Strathcarron the pain has gone and I can straighten the leg again. I look back towards the hills, unsure what just happened. What I do know is that I’ve never been so present in my body. Since injury, I’ve been forced to be conscious of every single footstep. And it’s propelled me into a magical state of mind, where I’m able to let go of things instantly as they arise. 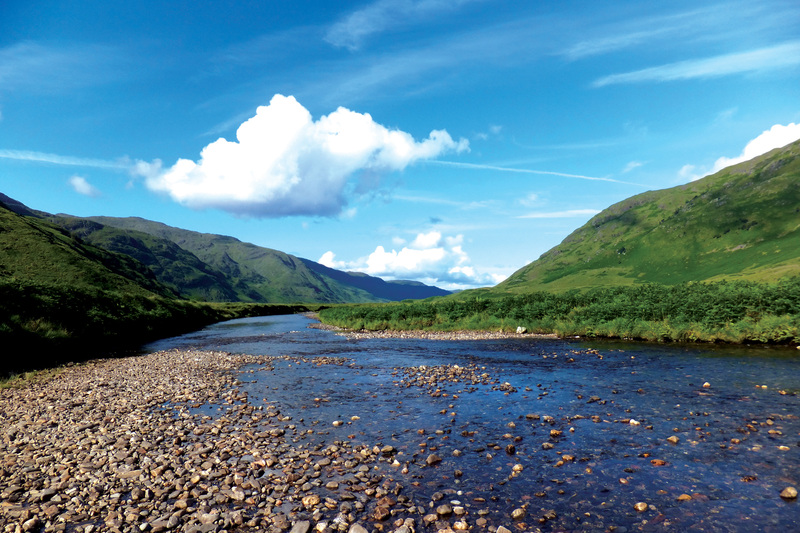 The Cape Wrath trail has certainly been a turning point. It’s taught me how to be comfortable in the uncomfortable, to dance not just in sunshine but in the midst of a quagmire. You can find the full article in the November/December issue of Outdoor Magazine. Subscribe today to keep up to date with all the latest outdoor adventures, travel news and inspiration.